The affect of aging varies from person to person as some people can drive well into their seventies and eighties while others simply cannot – and should not. 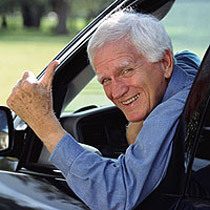 Statistics show that elderly individuals are more likely to receive a citation due to improper turns and failing to yield the right-of-way as well as running stop signs and red lights; these are all indications of the decreased driving ability that is often seen within the elderly community. This all happens because of the change of perceptual and sensory functions as we age which may include visual decline, hearing loss, current medications and dementia. Additionally, when accidents do occur, the injuries are much more serious for the elderly than they would be for an individual half their age that is involved in the same accident. La Dolce Living: How Does Age Affect Driving? According to the statistics on the affect in connection with age, it is clear that fatal car accidents occur more within the elderly community than with accidents from any other age group. Also, because of their frailty, elderly drivers are at a higher risk of death after being involved in a car accident. Statistics also show that by 2030, the elderly will make up 25 percent of the people who are driving on the roads and will also be involved n almost 25 percent of the fatal car accidents. As of 2006, the National Highway Traffic Safety Administration revealed that close to 30 million elderly drivers were driving in America; 6,017 of these people were killed in a car accident which results in 14 percent of the total number of people that were killed in car accidents. Some things can be done to ensure driver safety when dealing with elderly drivers. Other than regular testing and monitoring your loved one, make it a more comfortable driving experience for them by lowering the steering wheel so they can see the road more clearly. Other tips include making sure to avoid driving when sick, injured or drowsy as well as avoiding any sort of multi-tasking when driving; this includes talking on the phone, eating and drinking while driving. Always make sure that you keep your hands in the 10 and two positions of the steering wheel and stay at least two car-lengths behind the car in front of you. DMV Answers: What Are Some Safe Driving Tips for Elder Drivers? There are warning signs to pay attention to when dealing with an elderly person or loved one and deciding when they should stop driving. Pay attention to whether or not they are struggling to read the street signs or if their vision is compromised in any way. Notice if they drive better during the day in comparison to their night-driving skills. Also make sure to keep track of when they get lost and how often this happens; if this is on familiar roads they have been driving for a while, this is a major warning sign. Another warning sign to look for is if they struggle when directions are needed to get somewhere and when they have to go at higher speeds, such as on a highway. Other warning signs to look for include the number of accidents they have been in and whether they were deemed as being their fault. Look at how often they miss turns, hit curbs or put pedestrians at risk during their time driving. Take notice to when they talk about driving and if they ever say that objects or people tend to come from nowhere. Informing a loved one that you feel they should stop driving may seem like a difficult task because the last thing you want to do is hurt their feelings. Before speaking to them, make sure that you have all of your facts in order. This includes all the observations you have made when it comes to their driving skills and any of the warning signs that you noticed. It also helps to have statistics on-hand so that you can provide them with real-world facts of what elderly driving can result in. Having this information on hand ahead of time shows your loved ones that you have done your research and that you really care about them when you go to speak with them. When speaking to a loved one, the first thing that needs to be expressed is your concerns for their safety. Make sure that they understand that you love them and you want to look out for their best interest. Do not criticize every move they make as this will almost always cause someone to become defensive. Make sure that they understand the risks that they take every time they get behind the wheel and express your concern for others’ concerns as well. How To Advice: Elderly Drivers: Stop or Go? After you have spoken with your loved one about your concern for their safety when driving, it is only normal for them to be concerned about how they will get around and live life without driving. If they live with someone who can drive whether it is you or another friend or family member, this will make it easier for them to adjust to. They know they have someone around that is willing to help take them to the store, go out to eat or even ride to work with. If they do not live with someone, this can be a bit more difficult in ensuring them that it is possible to live without a vehicle. Public transportation is one option that they can use when they need to get around. If they need to only get back and forth from work, they can participate in a car pool with other co-workers that live in their area.